This human resources tool kit provides forms and other materials for HR professionals to use as templates to assist them in the hiring process. The more than 80 samples of useable documents include employment applications, interview guides and questions, evaluation forms, reference check forms, and telephone screening forms. Also provided are practical insights and tips for developing an employee selection strategy with discussions of legal considerations, such as disclaimers and types of questions to avoid during interviews; how to “read between the lines” when evaluating employment applications; and how to develop effective interview questions that are hypothetical, behavioral, and closed or open-ended. Tips on recruiting Hispanics and employment applications and other materials written in Spanish are also included. 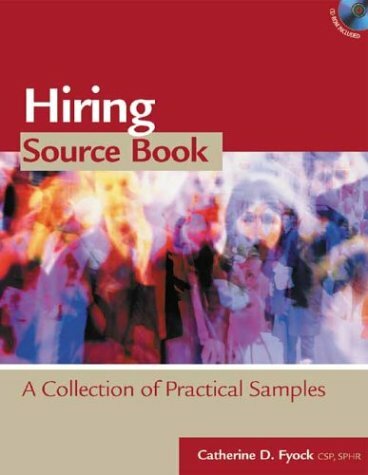 An accompanying CD-ROM contains all of the hiring and selection forms in the book in both PDF and rich text formats for easy use and adaptation.